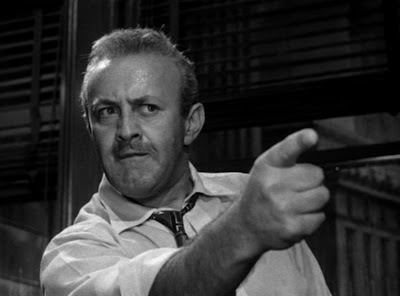 The other night, I caught the last hour of a movie masterpiece on TV: Sidney Lumet's 12 Angry Men. It is an inspiring film to watch, in and of itself, full of that 1950's mixture of sinewy intellect and bongo-driven, twelve-tonal avante-gardeness. It is a film that simultaneously, as much of the art of that period did, praises and condemns the register of human action and tendency. But the old stream-of-consciousness kicked in when I again saw Lee J. Cobb, the disgruntled father who wants a young man to hang as a result of his own feelings against his own rebellious son. Seeing Cobb made me think of Arthur Miller's Death of a Salesman, in which he played the first Willy Loman. I can't even think of that play without feeling emotional. In my humble opinion, it might be the highest work of art in the history of American letters. Miller captures the common human struggle in that play in a way in which only he can. I have always seen Arthur Miller as a hero -- as the writer I wish I could become. To give you perspective, when it was announced that Arthur Miller had died, in 2005, I was driving and had to pull to the side of the road to contain myself. Granted, I am an emotional guy, but it rarely comes to that. At any rate, when I was watching the film and I thought of Death of a Salesman, I got an all too familiar pang: Please, God, just let me write just one thing that good -- one thing that can move my fellow man the way Miller moved me. This is an ache not unlike the feeling of an earnest young crush -- a passionate, pure love for someone else who doesn't have the slightest idea that you cry and sigh at night just praying for the feeling of her palm in yours. I have known this feeling at increments all my life (both for love and art), and while I recognize it as real, I am also aware of its fiery transience, just as I am aware that Miller didn't write his masterpiece in a rush of passion but in a series of intense intellectual, meticulous visions and revisions. Still, I went to bed with an aching heart, thinking of Willy and his son Biff -- of the seething secret that connected them; of the real tragedy of Americans dreaming of grabbing a prize they cannot define; of Miller's deep, realistic yet mystical wisdom in painting a portrait of what can go wrong with the American dreamer. But the next day, sitting on the couch and having coffee with my wife as we do on our days off (and whenever else it's possible), I looked out the window and saw my nine-year-old son wearing his baseball cap and tossing a ball into the sky and catching it with elaborate dives accompanied by announcements of glory as he lived the fame he knows will be his, someday, in the Majors, I realized the stark truth that all writers must face, even (maybe especially) in the afterglow of great inspiration: The wonder and the reality and the profundity of this moment -- of a boy imagining, dreaming and pretending -- has never been and will never be captured by a pen. Not with all its colors and shades. Life is so much bigger than art. Strange as it may seem, it took me a few decades to really believe that. The messenger of reality's wonders doesn't stride the stage boards, bellowing and gesticulating as if to tear down heaven's roof; he wears a tiny ball cap, hates baths and laughs belly-laughs at the mere mention of flatulence. Well, eff me. That's the finest thing I've read this month. yeah you captured that "everything" writers go through and the compete inability to really nail "it" as well no matter how hard we try, no matter what words we choose. Yet we hope and we just keep on trying -- because we have to. Forgot to post, hope you read this at some time. It intrigues me that you can look at the challenge of the author as the challenge of all who live. we try to accomplish finding the answers of life, just as poets and authors try to find the perfect way to explain it. Very true, my friend. I think that intertwining of the two is what keeps me interested, in the long run.